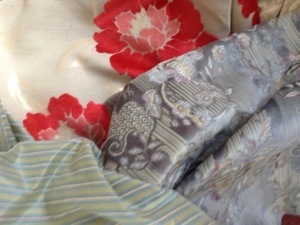 As soon as he heard about my challenge the wonderful Derek of DeeCee upholstery in Portswood rang to offer fabric. Wow! I’ll be more confused than ever about what to use! Www.deeceeupholstery.co.uk. I made a wonky paper pattern for my last batch of cushion making, but knew Peter would be able to create something that’s actually square! He found a bit of old wood and is working his magic for me! 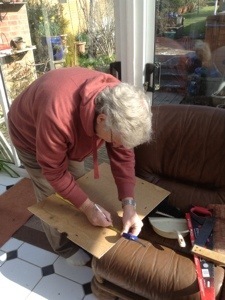 If you’re making a cushions cover you want it to be smaller than the cushion pad so that it plumps up nicely…so Peter is creating a 17 inch square for my 18 inch cushions. 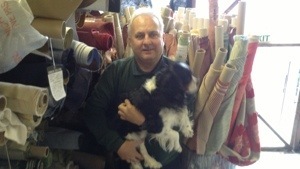 Derek and Leo from DeeCee Upholstery in front of the huge bin of fabrics Derek let me help myself to!